Every one in this house seems to busy, these days. What could be the reason? thought Kuttapu, the 8 year old parrot sitting in the cage at the backyard of the house. Kuttappu was very hungry and tired. It is already half past two. Still no one has bothered to give me food. I'm still sitting here with my old and stale fruits, scattered all over. These were given to me yesterday morning, and nothing new was given to me in the evening. This situation doesn't look normal to me. 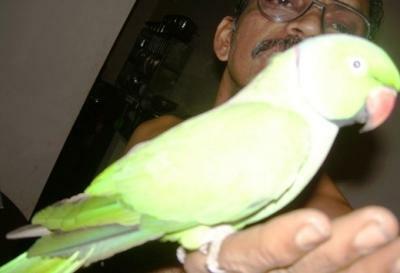 My master, Chandran, used to visit me every day morning, and chat with me for some time. Today, he hasn't come at all. Not even his formal questions of affections, "How're you Kuttappu? Did you get your food today? Did you sleep well?" I really enjoy those moments with him, and express my response through sounds, which only he would understand. At least my friend Pinky should have come to talk to me. Where is she? Every day morning when she gets up she would come straight to me and spend a couple of minutes chatting with me. “I feel terrible about this negligence. Whom should I complain about it? Who is there to listen to me?”, thought Kuttappu. He thought that at least he would get his usual food in the night. He waited patiently for the night. Still no one turned up to him. Many people were coming to the house and going after some time. He heard voices of different people at home. A stranger came and talked to him, and left the cage door open. Kuttappu decided to come out and see what was happening there. He slowly tried to fly, lifting his little wings, but he couldn't succeed. Sadly he realised that since he was in the cage all his life, he doesn't know to fly like other birds. What is the use of being a parrot who cannot fly like other parrots? Slowly he walked through the backyard of the house and reached the garden. He saw some beautiful and tasty fruits on the guava tree. He wondered how to reach there and relish some of them. Kuttappu slowly and carefully climbed the tree, and managed to reach on top of one of the branches where there were some ripe guavas. He ate one full fruit and felt happy. cage for safety. But he realised he was unable to fly. He tried to lift his wings, but they were not strong enough to fly. He saw other birds flying freely on the air, and he wished he too could fly like them. As he heard the dog's barking again, Kuttappu tightened his grips on the tree, and sincerely wished his master or someone else would come from the house to help him. Filled with fears, he cried and cried there, and finally he fell asleep. When he woke up the next morning, Kuttappu wanted to call out his master's name. "Chetta ivide varu..... Chetta ivide varu..." But he was afraid, and thought that hearing his voice the cat or dog may come there and eat him away. He decided to wait there patiently. He looked towards the house, and felt that the house was empty. He didn't hear any one's talking from there. Where have they gone, he wondered. Terrified he sat there quietly, thinking of his foolishness of leaving his cage and venturing to see the outside world. When he was half asleep he heard his master's voice. Kuttappu's mind filled with happiness. His master has noticed his absence at home. He started searching for him. "Chetta, ivide varu.... chetta, ivide varu.." (Master, please come here). Kuttappu decided to respond, with twinkles in his eyes. His master heard his voice and came running, looking for him everywhere, but he couldn't see his parrot. "Where are you Kuttappu?" asked his loving master anxiously. Kuttappu felt the anxiety and concern in his master's voice. He slowly and gently came down from the tree, and said hilariously, "Chetta ivide varu..... chetta ivide varu....."
"Sorry, kuttappu. Yesterday I was too busy at home, and had no time to care for you. Your friend Pinky was getting married, and hence the house was full. All of us were very busy. Pinky has gone to her husband's house now. Only you are there for us now. My sweetheart, I won't neglect you any more. Please forgive me this time." Kuttappu felt happy and sad at the same time. He knew he was going to miss his dear friend Pinky now, but he was happy his master needs him now, more than before. He expressed his feeling by fluttering his wings, and touching his master's face with his beak. Thank you Vimala for reading the story and commenting on it. A sweet bird story well told,Lakshmi.